Maple roasted carrots are an easy vegetable side dish that you can throw together for any meal. Vegan, gluten-free, paleo, 5 ingredients or less. Time for some fresh veggies up in this house. Well I guess not technically fresh since these are roasted. But whatever, it’s time for some vegetables. After all the baking I seem to do for every holiday, I always seem to crave colorful + easy veggies for the week afterwards. It helps me feel lighter (literally and figuratively) after carb-loading on breads and sweets. In this case the holiday was Easter, and as much as I love my traditional recipes from my Nana I think I’m going to be eating just carrots for a while. Okay, maybe not JUST carrots. These are a great pairing for just about any dinner. I like to buy multicolored carrots so I really feel like I’m eating the rainbow (I get mine at Trader Joe’s). Toss on some fresh herbs (parsley or thyme are good options) to make it feel even healthier. The (REAL) maple syrup goes a long way, I use only a tablespoon of it per pound of carrots. Same measurement for olive oil. Also if you’d like to get fancy, try it with truffle oil! Adds a whole new dimension to the flavor. You could also use honey though it wouldn’t technically be vegan any more if that’s important to you. Fun fact of the day: Did you know bunnies don’t actually eat carrots? Or rather, they shouldn’t only eat carrots. I think they’ll eat them if you give them to ’em. But it’s not in their natural diet. Their main diet should actually consist of hay. I guess it wouldn’t be as fun for kids to leave out hay for the Easter bunny to eat? I don’t exactly know where that tradition came from. And yes, these are things that I spend my time googling. 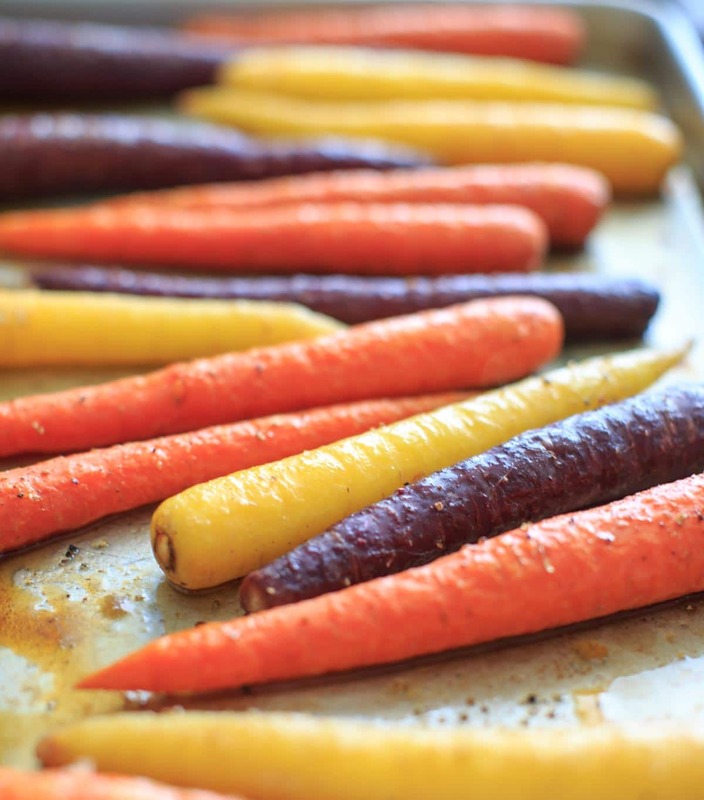 Place carrots on a baking sheet (use a baking sheet with sides so oil does not drip off). Drizzle olive oil over carrots, tossing by hand (or use pastry brush) to help distribute evenly. Repeat with maple syrup. Roast for 20 minutes or until fork slides in easily. Serve with fresh parsley or other herbs if desired. A serving is roughly 2 carrots. I love these multi colored carrots. Not only are they pretty but delicious too! I love that you roasted them with real maple syrup too. Really brings out the true sweetness of these babies! Hi, Kelly…It’s Pat here…..it was a pleasure to meet you at the Charlston, SC conference. 🙂 These rainbow carrots look and sound delish! I have tasted honey-glazed carrots but have yet to try them with maple syrup. Great photo shots too! Pinning! Thanks so much Pat! 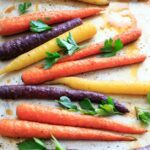 Honey glazed carrots were always a favorite of mine growing up, but I’ve been loving maple syrup lately! I love roasted carrots. It really brings out the natural sweetness. I need to make these with the maple syrup! 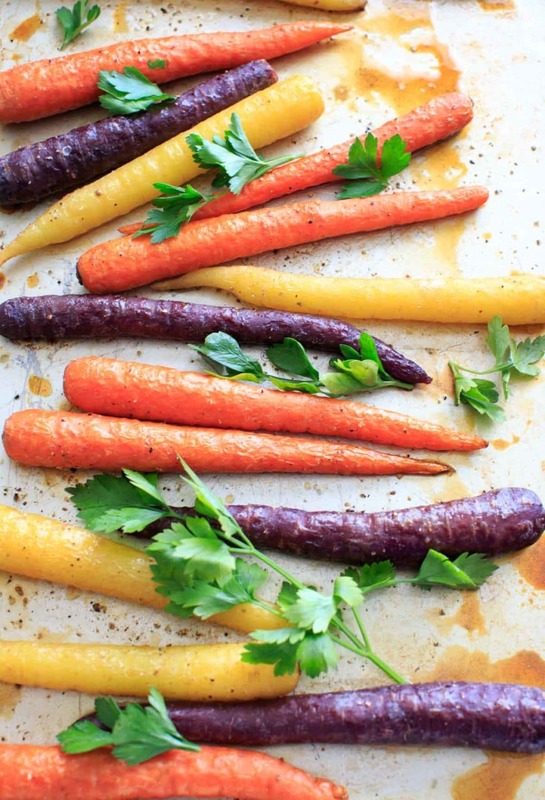 I love roasted carrots yes maple syrup brings out it flavor.I need to find this multicolored carrots, they not only delicious but also great in dinner table. Those carrots are absolutely gorgeous! I bet the addition of real maple syrup brings out their natural sweetness. What a simple and great recipe!! 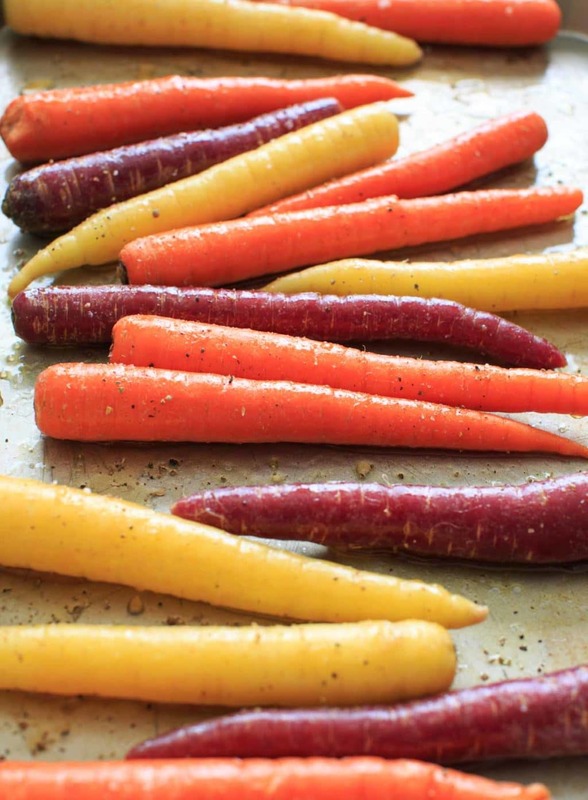 I really love the multi-colored carrots also and find mine at Trader Joes. Roasting carrots just brings out all the yummy flavors so I can only imagine how good these are with the maple flavor. This kind of side dish is best for meal. I liked this because its vegan, paleo free and for minimum ingredients. Oh my what amazingly colorful carrots, all i get here is the normal orange one, that looks fabulous! Roasted veggies with fresh herbs must taste amazing! So colorful and fresh looking!!! 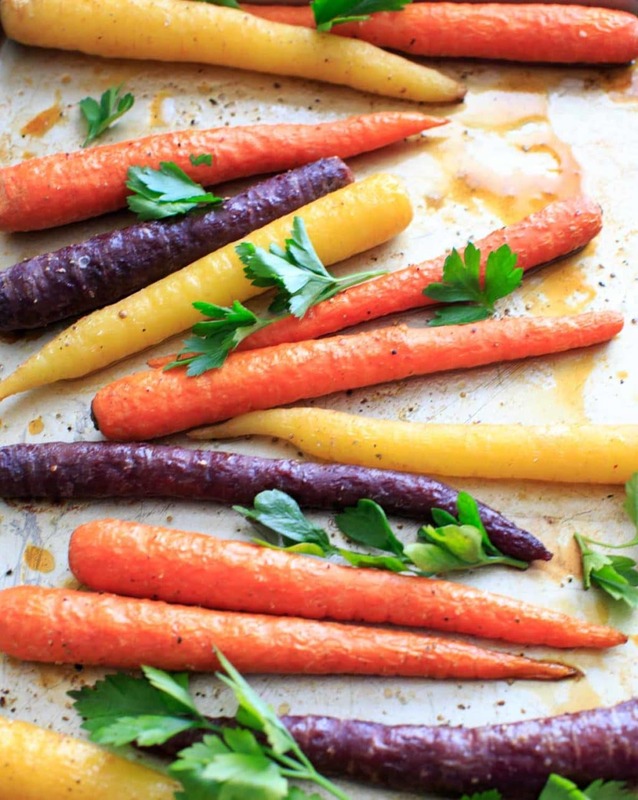 I love roasted carrots and have never done them with maple before…these sound like a must try!! Roasting the vegetables is my favorite way to serve them and it brings out so much of the natural flavors out. I love adding some maple and the carrots look great. love the colors! 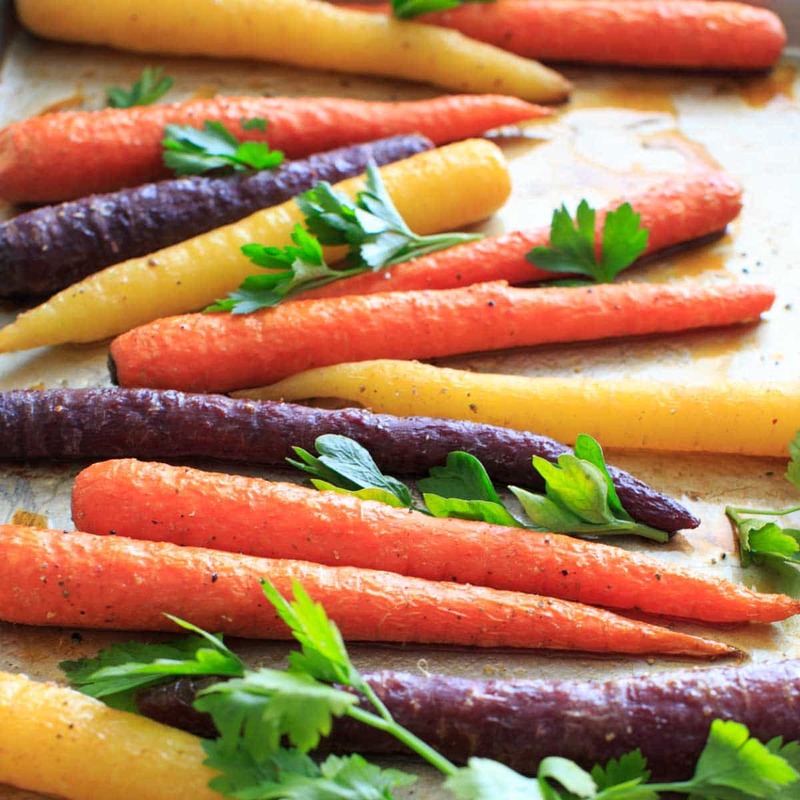 There’s something so exciting about fresh carrots and these look so delicious. I love that you used different colors of carrots for that pop of color. Never tried roasted carrots but seeing this makes me hungry! Yum!